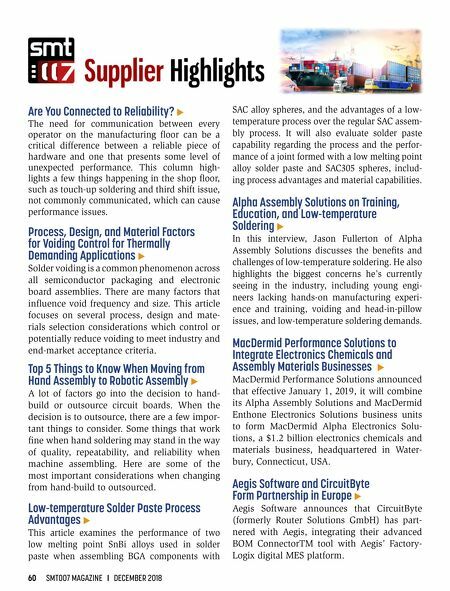 60 SMT007 MAGAZINE I DECEMBER 2018 Are You Connected to Reliability? E The need for communication between every operator on the manufacturing floor can be a critical difference between a reliable piece of hardware and one that presents some level of unexpected performance. This column high - lights a few things happening in the shop floor, such as touch-up soldering and third shift issue, not commonly communicated, which can cause performance issues. Process, Design, and Material Factors for Voiding Control for Thermally Demanding Applications E Solder voiding is a common phenomenon across all semiconductor packaging and electronic board assemblies. There are many factors that influence void frequency and size. This article focuses on several process, design and mate- rials selection considerations which control or potentially reduce voiding to meet industry and end-market acceptance criteria. Top 5 Things to Know When Moving from Hand Assembly to Robotic Assembly E A lot of factors go into the decision to hand- build or outsource circuit boards. When the decision is to outsource, there are a few impor- tant things to consider. Some things that work fine when hand soldering may stand in the way of quality, repeatability, and reliability when machine assembling. Here are some of the most important considerations when changing from hand-build to outsourced. Low-temperature Solder Paste Process Advantages E This article examines the performance of two low melting point SnBi alloys used in solder paste when assembling BGA components with SAC alloy spheres, and the advantages of a low- temperature process over the regular SAC assem- bly process. 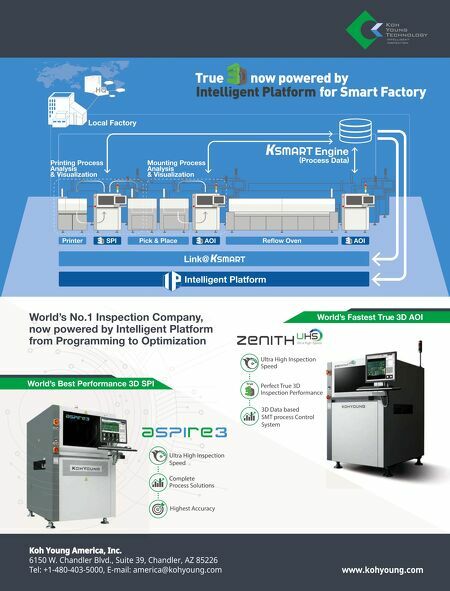 It will also evaluate solder paste capability regarding the process and the perfor- mance of a joint formed with a low melting point alloy solder paste and SAC305 spheres, includ- ing process advantages and material capabilities. Alpha Assembly Solutions on Training, Education, and Low-temperature Soldering E In this interview, Jason Fullerton of Alpha Assembly Solutions discusses the benefits and challenges of low-temperature soldering. He also highlights the biggest concerns he's currently seeing in the industry, including young engi- neers lacking hands-on manufacturing experi- ence and training, voiding and head-in-pillow issues, and low-temperature soldering demands. MacDermid Performance Solutions to Integrate Electronics Chemicals and Assembly Materials Businesses E MacDermid Performance Solutions announced that effective January 1, 2019, it will combine its Alpha Assembly Solutions and MacDermid Enthone Electronics Solutions business units to form MacDermid Alpha Electronics Solu- tions, a $1.2 billion electronics chemicals and materials business, headquartered in Water- bury, Connecticut, USA. Aegis Software and CircuitByte Form Partnership in Europe E Aegis Software announces that CircuitByte (formerly Router Solutions GmbH) has part- nered with Aegis, integrating their advanced BOM ConnectorTM tool with Aegis' Factory- Logix digital MES platform. Column — Welcome to the Big Show! Feature — Who's the Best of the Best in Hand Soldering? Feature — Shopping at IPC APEX EXPO: Evolutionary or Revolutionary Products?